First off, whole roasted cauliflower is EXTREMELY low maintenance. 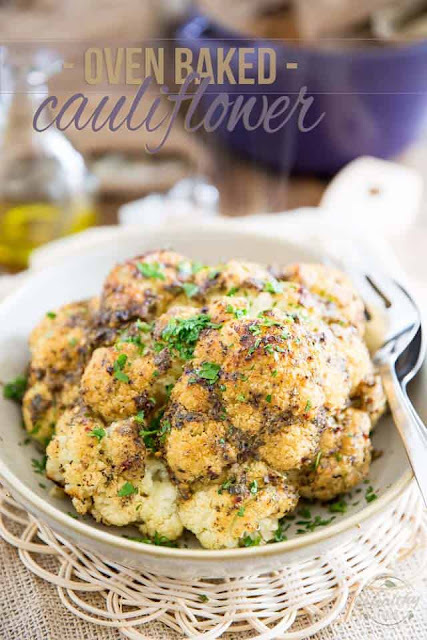 The cauliflower itself really doesn’t require much preparation at all and once it’s in the oven, it won’t really need you to attend to it much, except maybe to check for doneness after a little while and then switch the oven to broil once it’s done to your liking. Not what I would call complicated! Secondly, this cooking method won’t turn your entire house into a major stink zone! Rather, it will probably fill it with the loveliest sort-of-roasted-garlicky aroma. Not what I would call unpleasant in the least. 0 Response to "OVEN BAKED WHOLE ROASTED CAULIFLOWER"